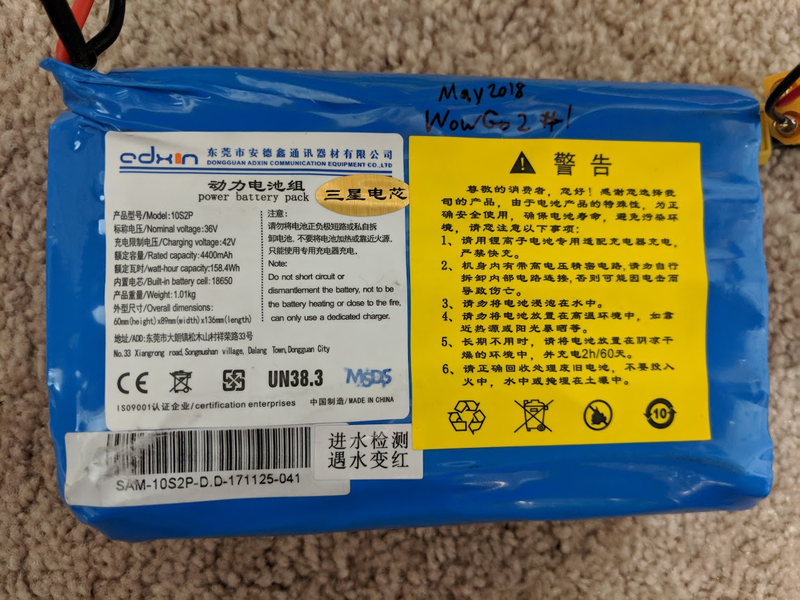 I have a couple of 18650-based 10S2P 36V nominal 4.4Ahr Li-Ion battery packs from my electric skateboard which I'd like to permanently put in parallel to double my range and improve my power during accelerating, regenerative braking, and hill climbing. 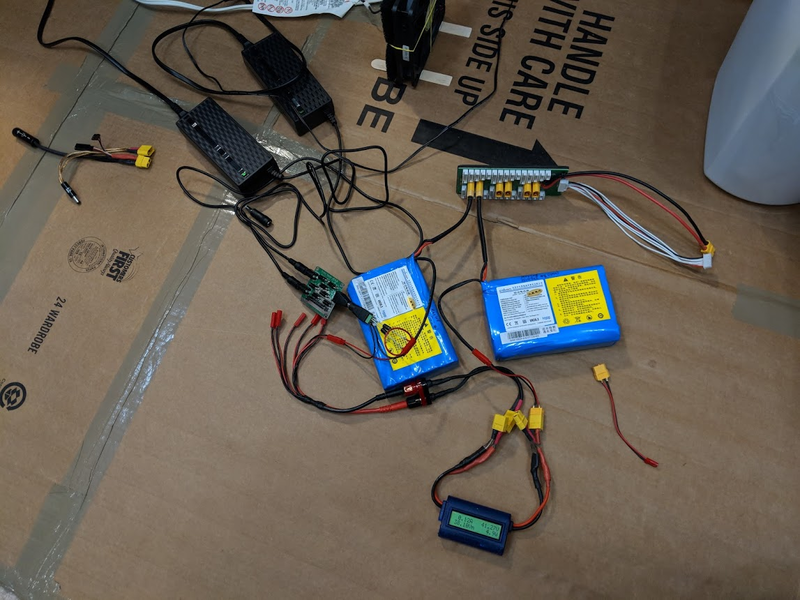 I've been charging dumb (withOUT BMS) LiPo packs in parallel for many years (Google "parallel charging lipos" and I wrote the article in the #3 link), and understand exactly how that works, but this is different since each pack has a built-in Battery Management System (BMS) and no balance lead. I don't have a schematic for the internal guts of the BMS, and although I'm an embedded engineer I have never built a BMS myself, so can only guess how it might work. Each battery has 2 plugs: a large 2-wire discharge plug, and a small 2-wire charge plug. These batteries are used in electric skateboards which have regenerative braking, so I presume the BMS is designed properly to allow incoming current through the large (discharge) lead. I don't know if there is any difference at all actually in how the BMS treats incoming voltage or current based on which of the 2 leads it comes in through: the small charge lead or the large discharge lead. Since regenerative braking must continue to work, I can NOT diode-"or" the discharge plugs, as that would block regenerated current from entering the packs. To guard against the unknown of the charge leads, I think diode-"or"ing them is probably a good idea. I'll use a couple 5A Schottky diodes. Each pack normally charges at 2A, with a min voltage of 30V and max of 42V. Will the BMSs fight each other? How do they really work? I presume that each series-set is monitored for voltage and that the BMS would PWM a transistor across the cell (3.6V nominal, 4.2V full), with a feedback loop, to maintain 4.2V once the 4.2V threshold is reached. It would then do this for each cell (or parallel set of cells) in series, so for my 10S2P pack, there would be 10 of these transistors in series being PWMed by the BMS as necessary. Is this true? This would allow other cells to catch up to 4.2V until all are there, and they are balanced. In the end, all 10 series sets would be 4.2V each, for a total pack voltage of 42V. The charger is 42V, with a 2A current-limiter. This means the charger enforces the CC/CV charge technique required, NOT the BMS it seems. I've already charged the batteries as described, in parallel, once, as shown here. I'm about to go ride it. About the picture: I've got 2x 2A chargers diode-"or"ed together via a custom PCB to simulate a single 4A charger. This 4A output then splits via a diode-"or" to 2 separate battery packs and goes into their small charge leads. The diodes here make the charge leads unable to let current flow out, so no inter-pack-balancing can occur through the charge leads. The large discharge leads are connected directly in parallel, so inter-pack-global (ie: whole pack voltage) self-balancing is automatically occurring via the large discharge leads. The current meter shown in the picture indicates only 0.12A at 41.27V since the packs are nearing completion, which will be approx. 41.4V since I've got 2x Schottky diodes in series dropping the charger end-of-charge voltage from 42V to ~41.4V. On a single pack, disconnected from everything, and at ~36.7V, I measured the voltage across the charge lead, and the discharge lead, and they are identical, so no diodes appear to be in either side of the circuit internally. I also measured from charge lead GND to discharge lead "+", and from discharge lead GND to charge lead "+", and they are identical too, meaning maybe diode-"or"ing the charge leads is silly if I'm just going to have the discharge leads in direct parallel anyway, since this test seems to indicate no difference between the 2 leads (charge vs discharge leads) other than wire gauge--but I still can't be sure---maybe the BMS will throttle incoming current through the charge lead but not the discharge lead? Any thoughts? Can I do it? Is it safe? Is it ok to parallel 2 packs like this, each with their own internal BMS? Here's one article I read for background: https://electricbike.com/forum/forum/knowledge-base/batteries-aa/20725-paralleling-bms-protected-li-ion-packs. It looks pretty-well written, but is definitely NOT written by an engineer--or at least not an electrical engineer, but I do like that it provides anecdotal evidence indicating this practice is at least done by some in the electric vehicle (EV) community--like me. UPDATE: I rode my board with these 2 batteries in parallel. It rides awesome! Soooo much more hill-climbing and accelerating power. I also noticed significantly improved and more reliable regenerative braking, especially when nearly full. Power also is sustained throughout a much longer ride, and of course range is nearly doubled. It's like a whole new board. Now what's going on internally with each BMS? I have no idea, but I get the impression they don't mind being in parallel like this since internally each BMS still gets control over its own individual cells, even if the global pack voltage is forced to a certain value by the battery in parallel with it. Here's a photo of my board with two batteries strapped on top in parallel, as it was when I rode it last night. Side note: the speed controller limits to 25A continuous and peak it looks like (which is ~25A x 36V = 900W), and this board's top speed is governed to 22mph, with apparently no Integral term in its controller, so it frequently used to stay at 20mph on long straights. With 2 packs in parallel it was able to hit the 25A and 22 mph limits much more easily and for a much longer duration of the ride, rather than having the voltage sag of the 1 pack be the limiting factor in speed and power. No wonder these skateboards catch fire all the time with such poor battery management. Lithium Ion batteries absolutely need BMS to safely charge (and discharge). Hopefully the packs at least contains protection circuitry to prevent over and under voltage. Regarding your question, yes you can parallel two packs without problems. How ever you should balance the packs before connecting them together with some power resistor first. When the balancing is done you should connect them together and keep them connected permanently.